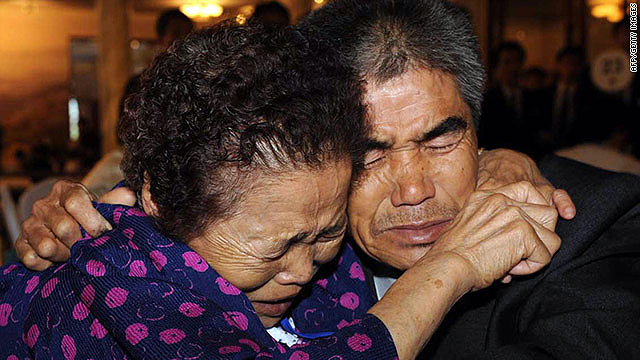 A South Korean mother cries with her North Korean son after meeting at the Mount Kumgang resort, on September 28, 2009. (CNN) -- The last South Korean employees left Mount Kumgang resort in North Korea Tuesday morning as the struggle over the scenic mountain facility continued. Fourteen South Koreans and two Chinese workers left after 11 a.m. Tuesday, South Korea's Unification Ministry said. The ministry said it had no idea when the workers might return. The move came a day after North Korea announced it would seize all assets in the area. The joint project at Mount Kumgang was started in 1998 to boost reconciliation between the two Koreas and to give North Korea a chance to earn money. But Seoul suspended South Korean tours to the facility after the 2008 shooting of a South Korean tourist by a North Korean soldier when the woman allegedly walked into an off-limits area. North Korea said Monday it would seize the South Korean properties that it said had been abandoned by Seoul and gave the remaining South Korean employees 72 hours to leave. South Korea has rejected the North's threats. The Unification Ministry issued a statement saying, "We cannot accept North Korea's unilateral announcement of freezing South Korean assets in Mount Kumgang. We demand the situation be restored immediately." South Korea says it wants security assurances from the North before allowing South Koreans tour groups to return to the resort. North Korea wanted the tour groups resumed immediately. Pyongyang has periodically threatened to seize the resort unless the tours -- a key source of foreign currency for the impoverished regime -- were resumed. Recent talks failed between the two sides and Hyundai Asan, a private South Korean business that invested millions of dollars in the project.